Wowza. I don't know how the MPAA let them get away with this, but awesome, let me say that. I'm guessing the lack of any cigarette/joint makes all the difference. Two new posters and a first look photo have debuted for American Ultra, the new film from a script by Max Landis (of Chronicle, The Death and Return of Superman) directed by Nima Nourizadeh. Actor Jesse Eisenberg plays a stoner named Mike who, along with Kristen Stewart as his girlfriend, it turns out is a sleeper agent, and the government is trying to eliminate him. They definitely both look like stoners, with Eisenberg donning a wig, and Stewart dying her hair for the part, the only thing that really is missing is a joint. Take a look at all the new images below. A stoner and his girlfriend's sleepy, small-town existence is disrupted when his past comes back to haunt him in the form of a government operation set to wipe him out. American Ultra is directed by filmmaker Nima Nourizadeh, of Warner Bros' smash party hit Project X previously. The screenplay was written by controversial writer/artist/filmmaker Max Landis, who can currently be found on Twitter @Uptomyknees. Nourizadeh tells MTV, "“You start with this kind of like sweet love story… I don’t want to turn people off with that, but what’s really unique about this movie is the fact that it’s like this kind of crazy action-comedy, but really at the core there is this like romance and there’s this love story where all he wants to do is to propose to her." 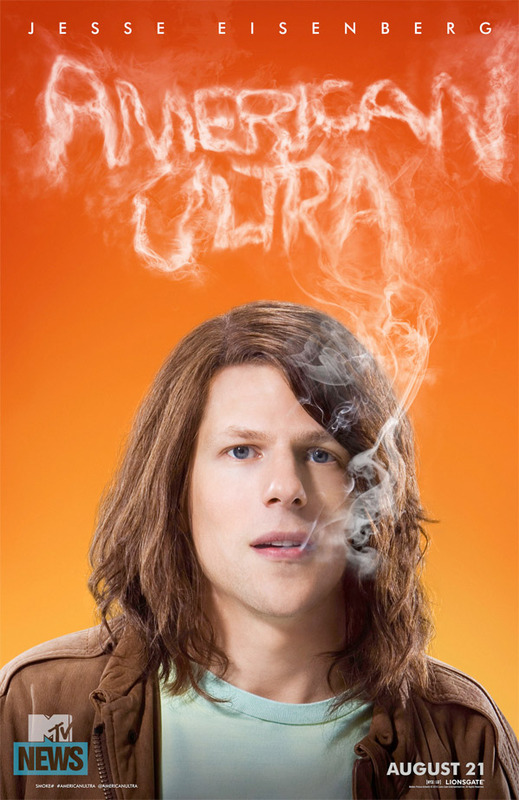 Lionsgate will release American Ultra on August 21st, 2015 this summer. You dig? Ladies and Gentlemen, Lex Luthor. Didn't know Kristen Stewart is in Batman V Superman. For a second there I was sure the second poster was Kristen Stewart.